While going thru some files on my computer I ran across these article I found online concerning two incidents onboard the ship which I was present for. I added my comments underlined for additional details. NORFOLK NAVAL BASE — For the second time in its current six-month deployment, a crew member assigned to the aircraft carrier USS America has fallen overboard. Search crews continued Thursday night to look for the sailor, who fell into the Atlantic late Thursday morning. The sailor's name was being withheld until relatives are notified, the Navy said. The America, returning to Norfolk following the final Mediterranean cruise of its 30-year history, was roughly 172 miles east of the Azores when the sailor fell. According to 2nd Fleet spokesman Cmdr. Paul Weishaupt, the America was being resupplied by helicopter on a windy, sunny morning while sailing alongside the USS Butte. At about 10 a.m. - 5 a.m. EST - a lookout on the rear of the carrier saw the sailor floating in 10- to 12-foot seas, Weishaupt said. Helicopters began an immediate search and were joined by the Butte, the Normandy and the South Carolina, Weishaupt said. The America, scheduled for decommissioning this year, is nearing the end of its six-month cruise; it had already been being relieved of its Mediterranean responsibilities by the USS George Washington. On Nov. 25, 1995, another America crew member fell off the ship. The carrier was nearly three months into its current deployment when Lance Cpl. 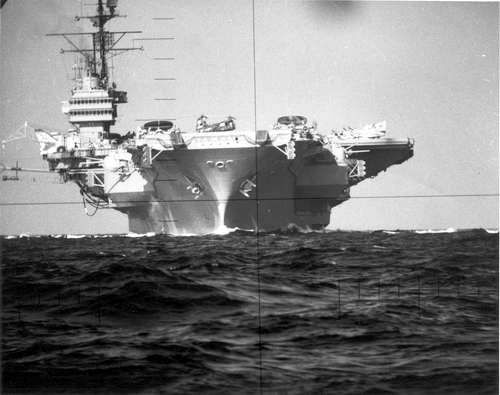 Zachary R. Mayo fell off the rear portion of the carrier after he was struck from behind by a swinging door, according to Mayo's own account. Mayo's absence was not noticed for more than a day, and an extensive search by the Navy yielded nothing. But the 20-year-old Marine survived. Mayo, an aircraft hydraulics mechanic with Marine Tactical Electronic Warfare Squadron 3 out of Cherry Point, N.C., remained afloat 36 hours before being plucked out of the Arabian Sea by Pakistani fishermen. The America and the 13 ships that accompanied the carrier on its deployment are due in Norfolk on Feb. 24. Said Weishaupt, "The schedule still has them arriving on the 24th, but their full focus now is on the recovery."